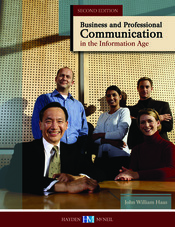 Business and Professional Communication in the Information Age is a textbook that is designed to achieve two broad objectives: advance students’ knowledge of the communication process in business settings and secondly, strengthen their skills as a speaker. Through this text, students will learn how to prepare, deliver, and evaluate messages in organizational contexts through a combination of oral and written assignments. They will also develop an understanding of the ethical responsibilities associated with business communication. Finally, the text works to hone students’ interpersonal, group, and presentation speaking skills by engaging them in a series of individual and group presentation exercises.